Leo Hisan (Ibn Hisan x Two Eyed Powder Puff AQHA) 2007 Palomino gelding. 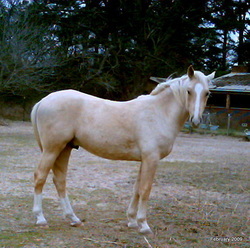 The only Half-Arabian and only Palomino that I have ever bred, Leo has some of the best attributes of both his Arabian sire and his Palomino AQHA dam. Double-registered (HAHR and PHBA) he can be shown in Palomino shows as well as Arabian and open shows. His new owner, Alexie, has trained him for riding & I hope to continue to hear of them enjoying their time together for many years to come. Update 1/3/2012: Leo has a new home with Patricia Carpenter, of Houston, who loves him dearly. Thank you, Patricia, for contacting me about Leo! Congratulations to these happy new owners! May you have many wonderful years with your Diamond Magic horses! 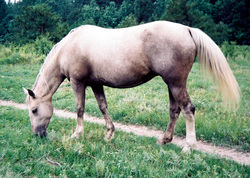 Two-Eyed Powder Puff AQHA Palomino mare. Powder Puff has a wonderful new home with Penny & family. She is loved and appreciated, intended to be a "foundation broodmare" for a new breeding program. Plans are to breed her to an Andalusian or Lusitano stallion, to raise PRE (Spanish-bred) foals for sport, show and family pleasure riding.